I’m so excited to share this project with you guys now that it’s finally done! It’s been a long time in the making, but I’m so so so happy with the end result and as it usually goes – the delays that occurred along the way made the end result better than the original idea. 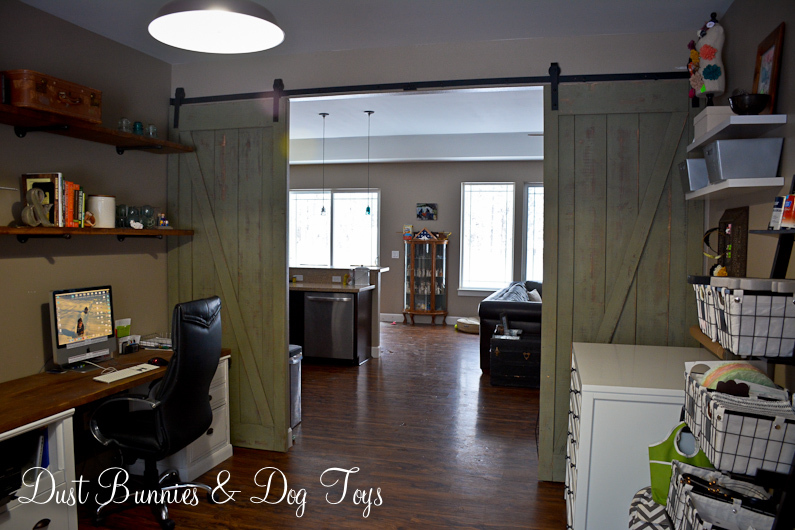 From the moment we found our floor plan and decided the formal dining room would be my office/studio/craft room I knew I wanted barn doors instead of the french doors the builder offered. But that wasn’t one of the priority projects when we first moved in so it had to wait. In the meantime I pinned ideas and the Hubs and I drafted out a basic plan for the project so we could start gathering the supplies as we found good deals on them. 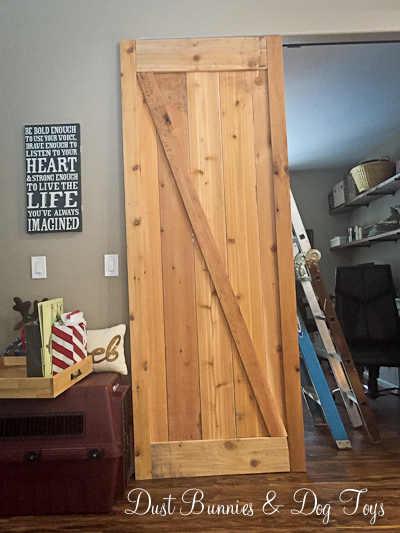 We originally purchased barn door hardware at Tractor Supply when we were in VA visiting my family over a year ago and shipped it back to ourselves in AK. It was nickel, but we planned to paint it black to better fit our style. Although we had the hardware, we still had other more pressing projects so they sat for several months. 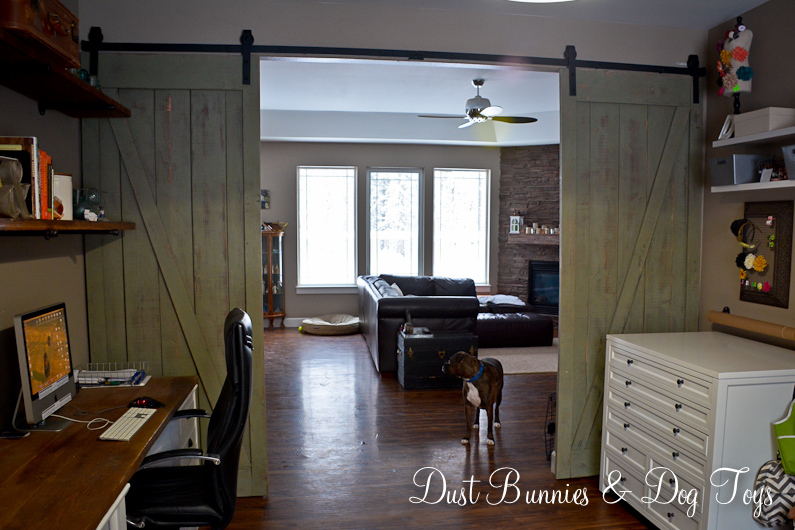 Eventually the Hubs purchased a piece of metal box rail to create the track and then built the barn doors, which I stained. We now had all the pieces we just needed to install them, so we dug up pictures of the house during the framing stage and quickly realized we didn’t have any of the header over this opening to determine where the studs were! Thinking back I remembered that because we opted not to have the french doors, the builder didn’t frame in the opening at first. We noticed this during one of our site visits and made sure he would add framing between the two walls so we’d have a spot to install the track. Apparently the next time we came back that had been added and drywalled over already. We could guesstimate where the studs were based on the screws in the drywall, but the Hubs wasn’t sure there was enough support for the heavy track and doors. 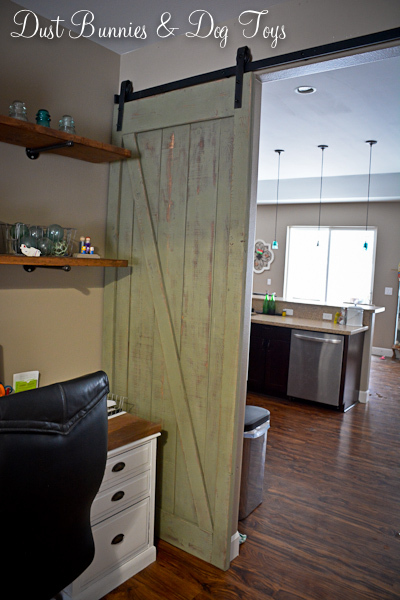 I was pretty bummed and started thinking I wouldn’t get the barn doors I’d been envisioning. 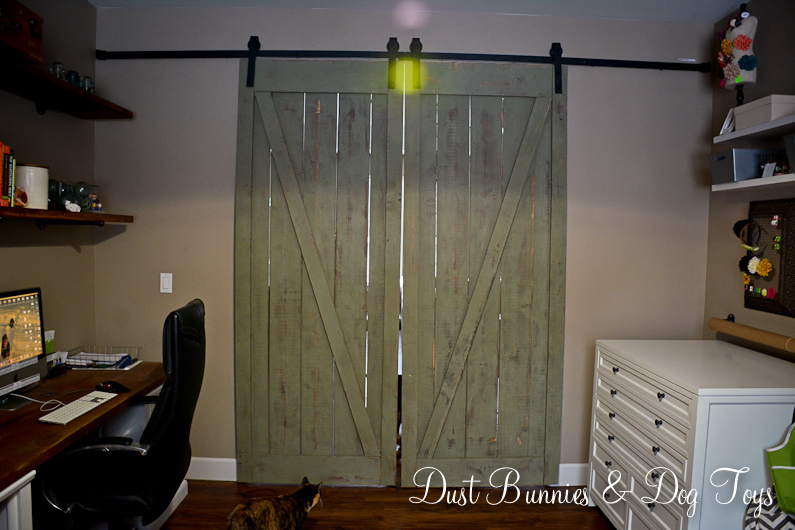 A few weeks later we saw a friend’s barn door project they had just installed and as the Hubs discussed the install with his fellow DIY-All-The-Crazy-Things-My-Wife-Thinks-Up husband, a new option was discovered. 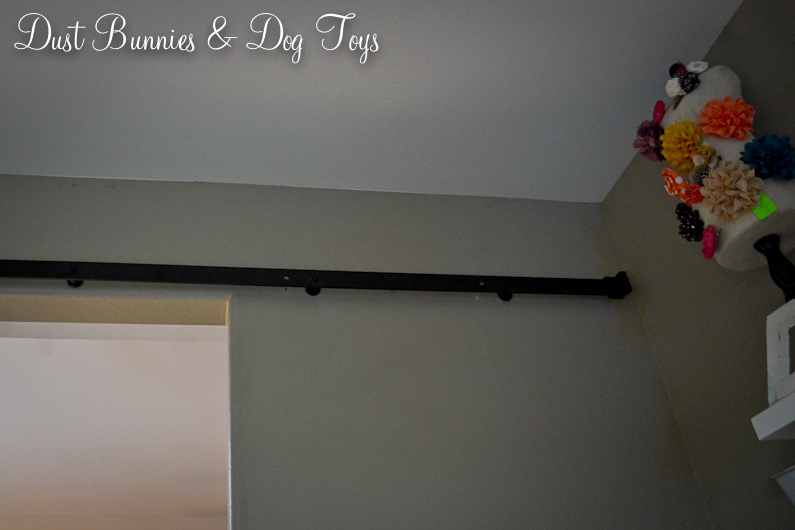 Their track and hardware was less bulky and not as heavy, so it didn’t need as much support as the system we had. They had purchased the kit on Amazon and really liked it so we were pretty confident we would feel the same way. The Hubs drew up a new plan and determined we needed to build new doors that weren’t as heavy as the ones we’d already prepped. It was a little disappointing, but I was excited to finally have the project back on track and feeling good that it was actually possible. I posted the track and the hardware we already had on the buy/sell page and the Hubs ordered a similar kit on Amazon. The kit arrived quickly, but life got crazy again and the project had to wait. Over the Christmas holiday the Hubs got things rolling again starting with installing the track in the office. He had to drill a few new holes for the support rods so we’d hit the studs but he made it work. 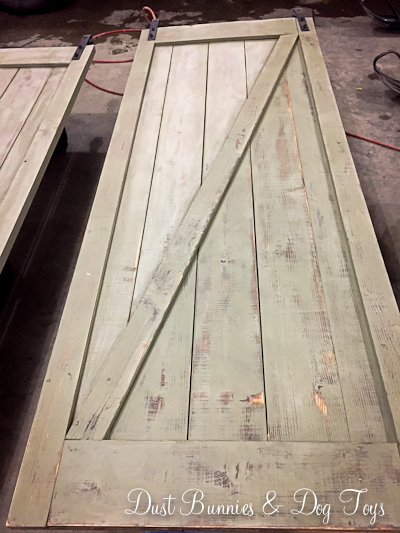 And then he built two new doors out of cedar planks using the same design as the original doors he’d built (which became backdrops for a recent show display and are now posted for sale). Although they were pretty in their natural state, the cedar had an orange tone that clashed with the other wood tones in the space. 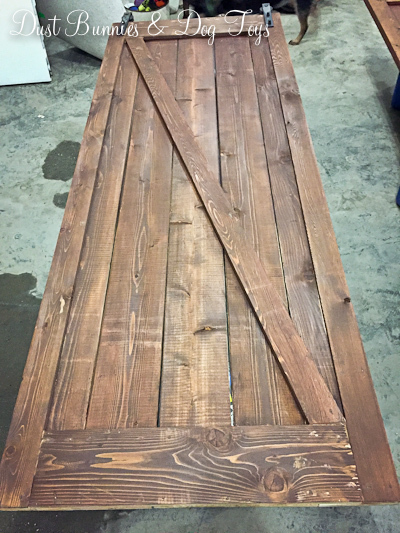 I’d been envisioning weathered, rustic doors like something Joanna Gaines would salvage and use. So we decided to stain them and see how I liked that. A coat of stain later, they were looking much more in line with the other elements in the room, but it was still too much wood for me so I decided to paint over the stain and then distress them so the bits of stain and wood would show through. The Hubs picked up white paint at the store and I planned to paint over the next few days. But then I saw the perfect color on a dresser one of my favorite bloggers was redoing for a remodel/flip house she’s working on and I knew that was what I needed. Unfortunately, she was using Maison Blanche’s Printemps chalk paint and there are no retailers for that brand here in Alaska. 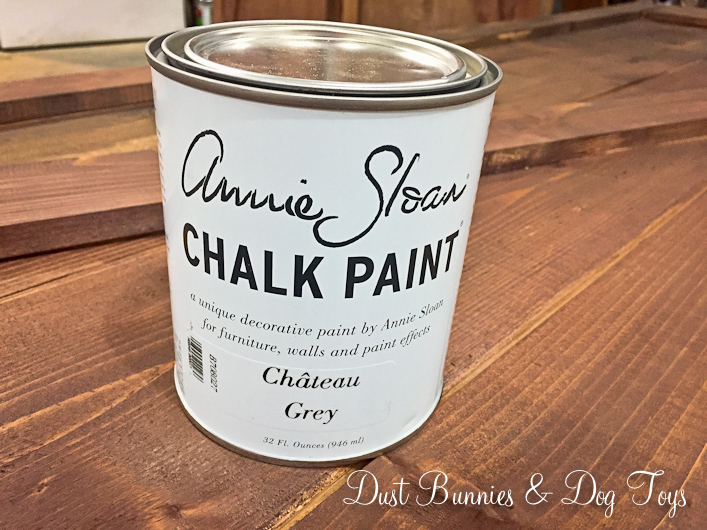 So I did some research and found a similar color in Annie Sloan’s chalk paint line (which said favorite blogger also uses often) that was available locally. 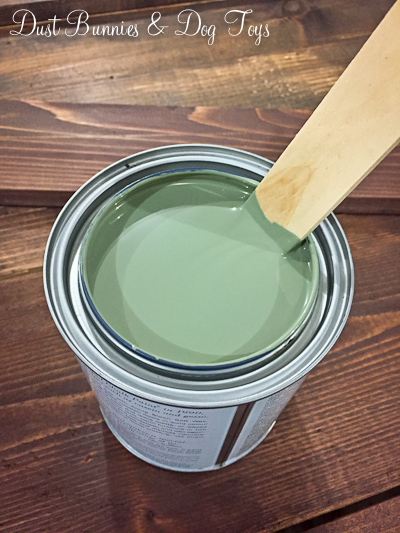 It’s called Chateau Grey, but it’s really a greenish grey color. Now that I had my perfect paint color I set to work. Since the weather has been in the negative temps and the doors were so large I set up shop in the garage with the doors propped up on various plastic totes. 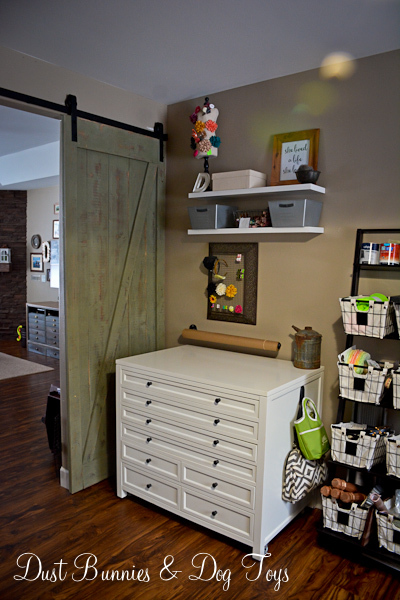 The Hubs joined me in the garage to organize and clean up a bit from several recent projects. 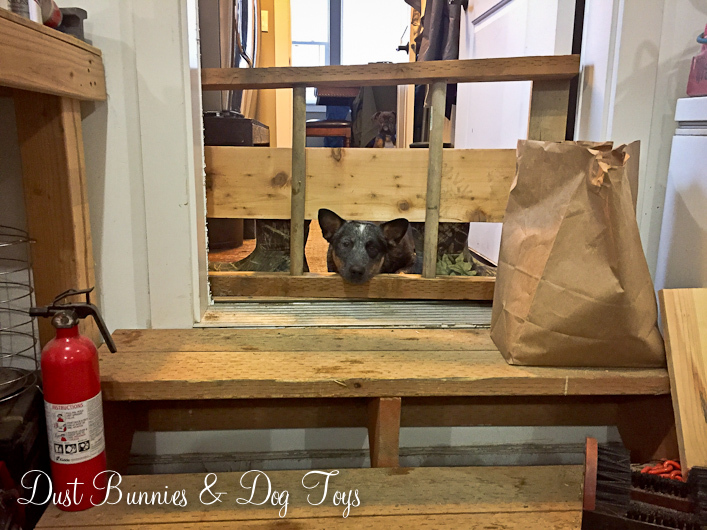 We left the door to the house open so the kiddos could be with us as well, but they weren’t staying out of the way enough so the Hubs rigged up an impromptu baby gate for the doorway. The ensuing pitiful faces were hysterical. 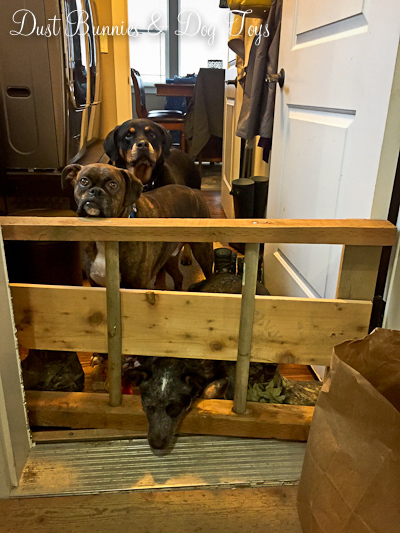 They whined and paced and made a few attempts to thwart this annoying obstacle. This was the easiest painting ever, because they recommend you brush in all directions for a rustic finish. Which means paint like no one’s watching.. except those sad little faces behind the gate! I cranked up the radio and boogied my way around the doors swishing my brush, and my bottom, to-and-fro. 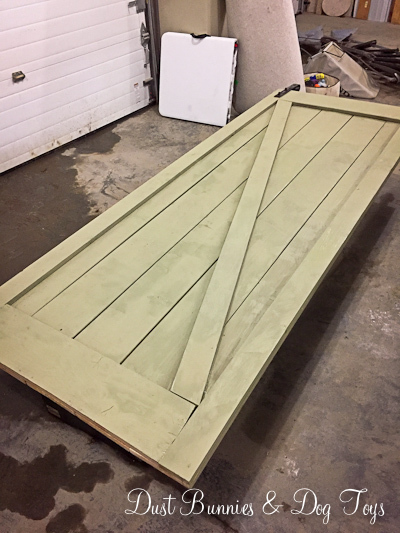 The end result was two very pretty greenish gray doors. Both the Hubs and I were really liking the color but my heart was set on that distressed look so he dug out the sander for me. As I got ready to sand I noticed this heart wrenching little face. While her siblings had given up and wandered off to nap, she sat like this for hours, sighing every so often just to remind me that she wasn’t pleased with being detained. Unfortunately for her, it was time to sand so we removed the gate and closed the door to keep the dust out of the house. A light sanding brought out so much texture! Just look at how different the one un-sanded panel on the right looks from the rest of the door. I had to hand sand in a few of the tighter spots but that went quickly as well. Because I was using a chalk paint the next step was wax to seal everything in and protect the finish from those slobbery children of ours. 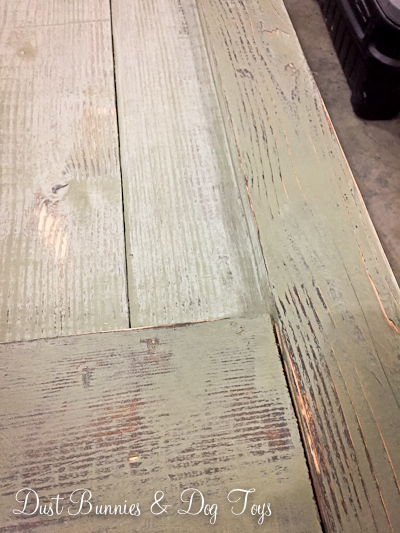 Although this wasn’t the first time I’ve used chalk paint it was the first time I’ve used it on a project big enough that required sealing, so this was my first experience with wax. 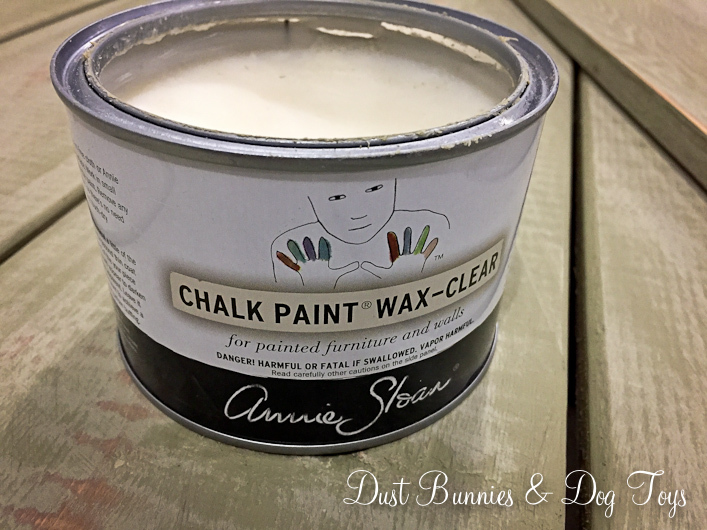 I used Annie Sloan’s clear wax so it would work well with the paint. Using the “boogie while you brush in all directions method” it went on very quickly although it was a bit straining on my hands because you ‘push’ the wax into the grain. A little pain was totally worth it because it really highlighted all of the texture the sanding had created. Just look at the difference between the waxed half on the bottom right and the un-waxed section on the top left! And up-close it had so much detail! To give you a better sense of how much the wax changed the look, here’s a shot of the difference. 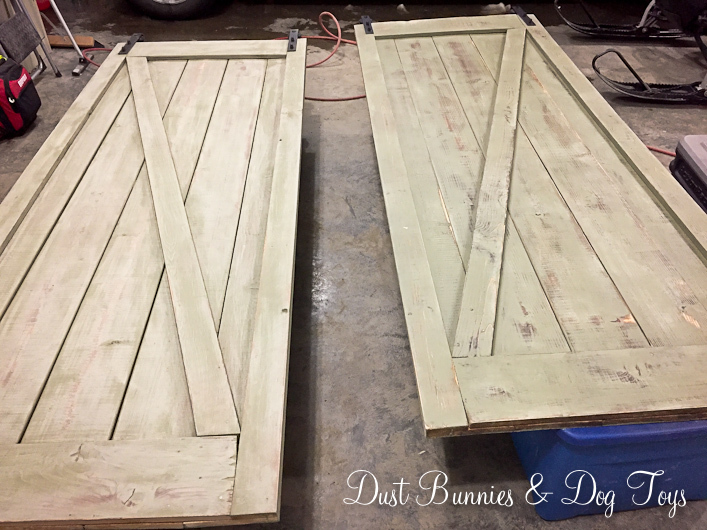 The door on the right has been stained, painted, sanded and waxed while the door on the left has not yet been waxed. 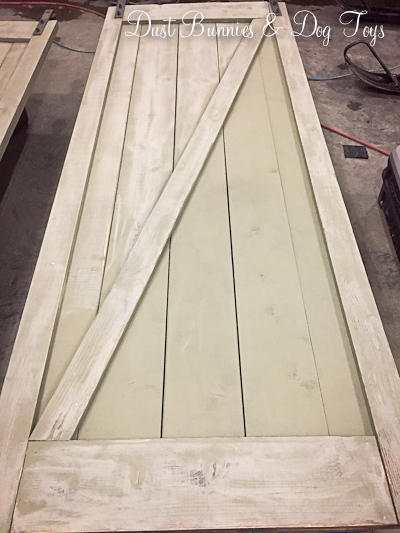 I got the front of both doors waxed and was going to wait a few hours to flip them over and wax the back side (yeah… just think on that for a moment…) but the Hubs made a great suggestion – why not hang them and I could wax the back while they were on the track. He’s seriously brilliant sometimes – which is one of the reasons I keep him around. 🙂 So up they went. The rollers on the hardware just sit on the top of the track and are very easy to install – it’s just a matter of lining them up and setting them on the track. I love how the black hardware looks with the green! 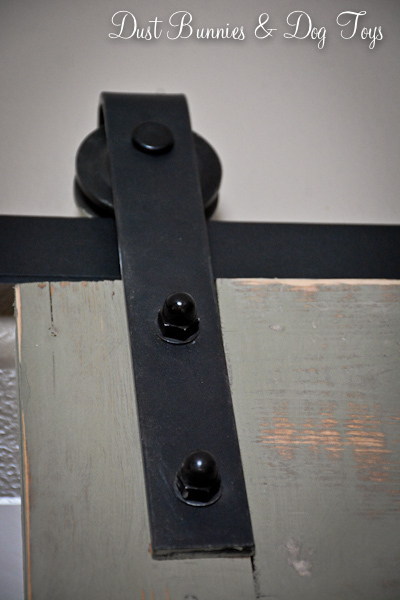 And it’s got an industrial rustic style that fits our home perfectly. Here’s a few more shots of the doors installed on the track and ready to glide back and forth. Seeing the green next to the white cabinets makes me so glad I didn’t paint them white. It would have been too much and this color really makes them look reclaimed rather than new. I could have stood here and stared at them all day. They look awesome open. 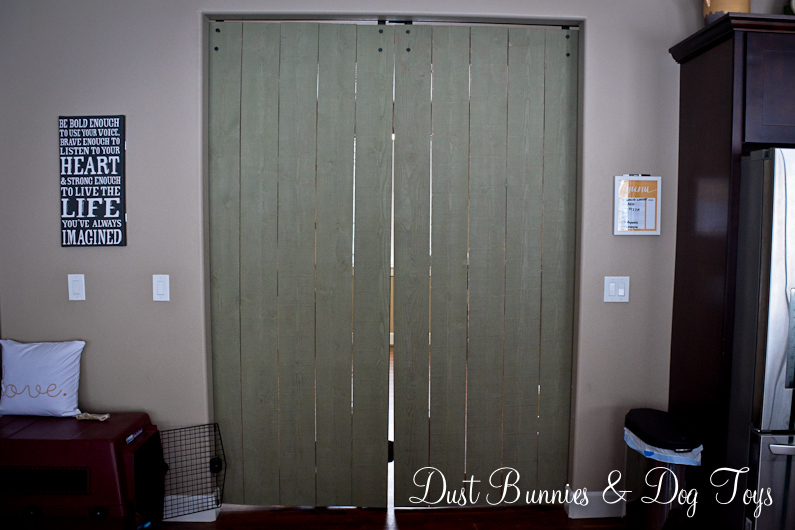 And closed – although the fur babies weren’t fond of this option! After we had them installed we noticed the door on the right sits at a bit of an angle from the other door creating a small space at the bottom of the seem between the doors. The Hubs thinks he may have installed the hardware a little crooked which is causing this issue. We’ll correct that at some point, but since the doors will be open 99% of the time that can wait a bit. Here’s how the doors look from the other side when closed. It’s not as dramatic as the office side, but like I said – it will be very rare that these doors are closed. I’m sure the fur babies are appreciative of that. In order to fill the whole opening we did have to make the doors a bit wider than the side walls, so they stick out just a bit. It’s not really noticeable and it actually works well because it provides just enough room to add handles so the doors are easier to move from this side. I haven’t picked out hardware for that yet, and since it’s not a priority I’ll take my time to find something I really love. There’s also a bit of extra room between the doors and the cabinets. 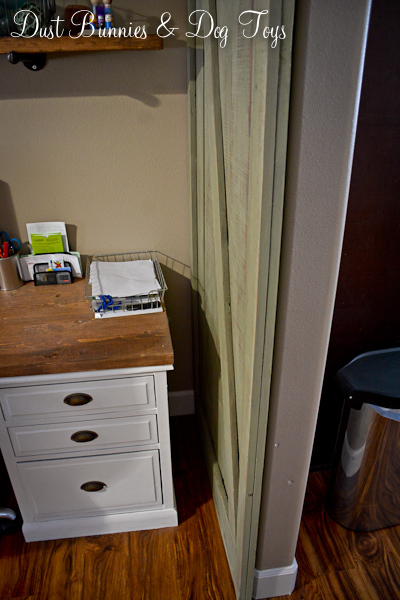 We built the desk when we were planning to use the original barn door hardware which would have hung away from the wall a bit further, so we left extra room for that. Now that we chose a more flush mount system there’s more room. I think it still works well and it’s just wide enough for me to sneak the broom in there when cleaning. Plus on the craft cart side it leaves plenty of room to reach back for my paper cutter without scraping your knuckles on the doors. I’d love to hear what you think of the end result, so leave a comment below. And if you have questions about anything I didn’t cover send those over too. Have a wonderful weekend! Thrifty Decor Chick’s Before & After Party! looks really good honey. whats next? 1. How do I find the tutorial for your “desk part 2” – saw the part 1 but anxious for the sequel! 2. What is the deal on the large white table with small flat drawers? Exactly what I need!! thanks! Just discovered you via Pinterest & love love love the name of your blog! 1. 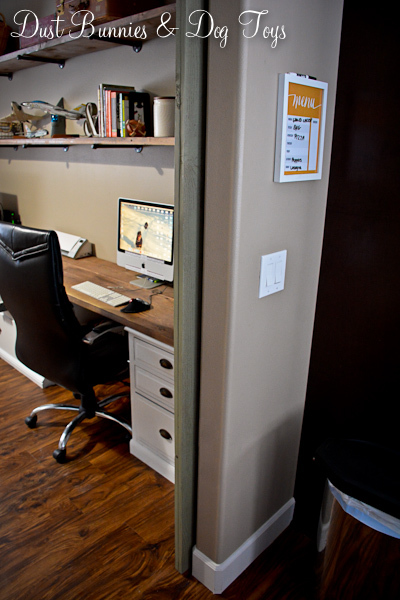 Check out the Wall-to-Wall Work Space post (https://dustbunniesanddogtoys.com/2015/05/19/the-office-craft-room-studio/) for a full recap of that project. It’s changed a bit since then so I should do an update post but it might be a while with other projects we have going on – although this post is pretty recent. 2. 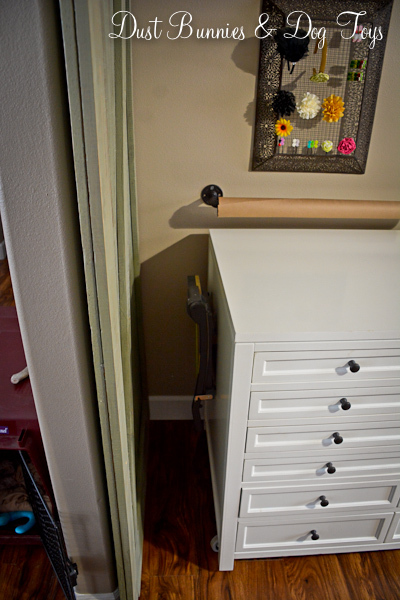 Here’s the original post about the crafting cabinet: https://dustbunniesanddogtoys.com/2014/07/22/my-new-crafty-corner/ I spray painted the knobs black for a bit more detail and have added shelves above and to the side for more storage. We purchased it from a company called Home Decorators that partners with Home Depot. I believe it was part of a Martha Stewart line. I love it still and it’s been a great way to store things and work on projects throughout the year!